The River Rothay near Pelter Bridge. This is a version of an article I had published in the January 2018 issue of Black and White Photography Magazine, to which you can subscribe here. For the past two years I have been photographing a short section of the River Rothay in the Lake District, roughly between the eastern end of Rydal Water, and the historic Ambleside stepping stones. The project began in the aftermath of Storm Desmond, an Atlantic storm that delivered unprecedented rainfall to the mountains of Cumbria, and Northern England. I have heard passing tourists compare this stretch of the Rothay in summer to a Cotswold stream. But on December 5th, 2015, the Rothay transformed into a raging giant fifty metres wide, carrying branches and debris from miles upstream, smashing bridges, and sweeping away many of the stepping stones themselves. It peaked at a record 3.71 metres, a whopping two metres above the level at which the UK government’s Flood Information Service says flooding is possible. I began by documenting the strange effects of the flood: fences tightly woven with grass and leaves, large stones flung across sheep pasture, and turf rolled up like a carpet by the force of the current. Since then, it has been the Rothay’s quieter moods that have held my attention. Over the course of a long project it is necessary to look at the same scene differently, not only because the scene itself changes, but also because you see it differently over time. While working on my Rothay project I’ve used both film and digital cameras to document the changing landscape, to capture the strangeness and unfamiliarity of the aftermath of the flood, and the slow return to normality. After almost two years I am beginning now to edit my images into a coherent collection, but when I had the opportunity to visit the Rothay with Sigma’s SD Quattro H and 18-35mm F/1.8 lens, I wondered whether an unfamiliar camera might help me find a new perspective on familiar territory. In particular I wanted to explore whether it might complement my medium format film images. The answer rather surprised me. In an early morning experiment I pitted the SD Quattro H against my Yashica MAT 124G and a roll of Fujifilm Acros 100. Allowing for the different sizes of imaging sensors, the Sigma at 35mm and F/1.8 (and cropped square) comes in roughly--very roughly--equivalent to the Yashica’s 80mm at F/3.5 in terms of field of view and depth of field. In theory, this should give a similar “look” regardless of the significant differences in sensor size. Of course, changing light, different characteristics of film and digital imaging, and lenses made 40 years apart, make direct comparisons pointless. But while the results from the Sigma are pleasing, it was while trying to frame to match the square aspect ratio of the venerable Yashica, that I stumbled on a feature that changed the way I used the camera from then on. In the well laid out main shooting menu--probably the best menu system I have used--is an option to change the format of the frame you are shooting. There is a range of options, from 3:2, and 4:3 through square, 16:9, and finally 21:9, widescreen. Obviously these are crop modes, and of course cropping can be done in post, but I’ve always liked the immersive, square viewfinder of my Yashica, because of the way it forces you look at a scene in a particular way. Because the Sigma is a mirrorless camera, something similar is achievable in its electronic viewfinder. The camera still records the whole sensor, so you can change your mind later if you like, but this way you are making the decision at the point of creating the image, rather than reframing after the event. And unlike many other mirrorless cameras, the Sigma doesn’t have to record the cropped frame as a jpeg, but in the RAW data, so no data is lost and the full range of adjustment is possible. Actually being able to compose the frame in the aspect ratio you want, while on location, is very liberating. While the square format was useful, what really caught my imagination was being able to shoot in 21:9 aspect ratio, similar to the legendary Hasselblad X-Pan film camera, and close to the modern widescreen cinema and classic Cinemascope formats. Being able to look through the viewfinder and see the widescreen sweep of river I was hoping to capture, or framing a candid portrait with acres of moody dead space, is a wonderful thing. And because of the high resolution of the Foveon sensor, even a cropped image like this has a potential size of 6192 x 2648 pixels: more than enough for large scale prints. Many film cameras made changing aspect ratios possible, using masks to expose different areas of the film to give different aspect ratios, including pinhole cameras, and even the humble Holga. But as in so many other areas, digital cameras open up possibilities for creative freedom without the need to wait until you’ve used a whole roll of film. As I came to realise during the time I spent on the River Rothay last August, the ability to shoot in different aspect ratios, and to compose for them in the field rather than after the event, is a compelling creative opportunity. I don't need much from a camera. Most of the features on a modern digital camera are not needed for the kind of slow photography I enjoy. I could live without auto exposure, autofocus, even an LCD screen. I hardly ever shoot video, and I tend to take one image at a time, so I have no real need for 10 frames per second. But there are two things I really like about modern digital cameras. The first is image stabilisation, to counteract my shaky hands, and the second is weather sealing. Not many cameras have good weather sealing, even quite expensive ones, but being able to take your gear out in the rain, and not worry about it, is worth any number of other headline features; a camera you have to keep in your bag during a rain shower is no good half the time in Northern Britain. The image above is of the Lancashire seaside town of Morecambe. It's a wet and blowy sort of place, and this was a particularly wet and blowy Sunday afternoon. I was absolutely soaked through by the time I was finished, but the camera was fine. This is just for fun, but one of these images was taken with a Sigma SD Quattro H digital camera, and the other with a Yashica MAT 124G, using Fujifilm Neopan Acros 100 ASA film. The slight variations in angle of view are to do with the way the different cameras sit on the tripod, and I think the light changed a little between taking the pictures. 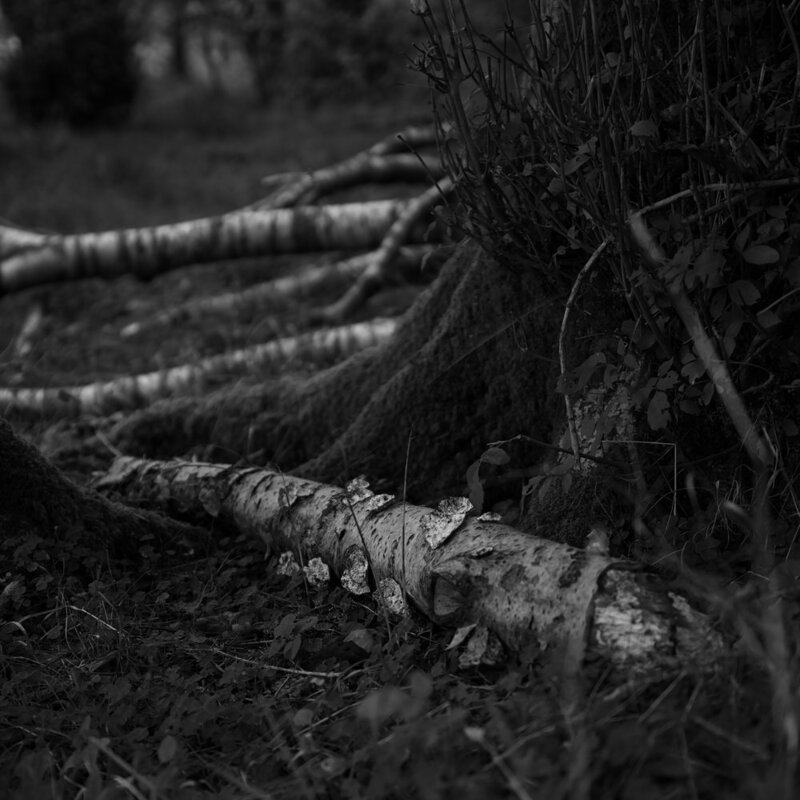 I used the digital camera to expose for the silvery fallen log in both cases. They are obviously quite different, but then they have different lenses, different, and differently sized imaging sensors, and were built almost 40 years apart. I'm having a hard time deciding which one I prefer: the one contrasty and hard, the other velvety and soft. They were taken in Rydal Woods, in the Lake District, early one morning. Click to see them larger. Thanks to Sigma UK for lending me one of their rather wonderful SD Quattro H cameras for a couple of weeks. I have some Lake District photos coming soon, but in the mean time, here is a field of leeks, from West Lancashire. At this time of year you can smell these fields from some way off.